Kasey’s latest book, Green Eyed Envy, is available wherever books are sold. If you have questions in any of the fields our contributors have graciously agreed to answer, please follow the “Ask your Questions” page instructions. A question hit my inbox recently regarding cautery. Basically, the purpose of cautery is to destroy tissue. The burns produced are typically second degree (blisters), but if handled clumsily can easily become third degree burns that go clear through the skin. Surgical cautery is often used in modern settings to seal a single stubborn blood vessel, to carefully pare off or to destroy unwanted tissue as in the case of cancerous cells, moles, or lesions caused by viruses, or to surgically separate tissues with minimal blood loss. 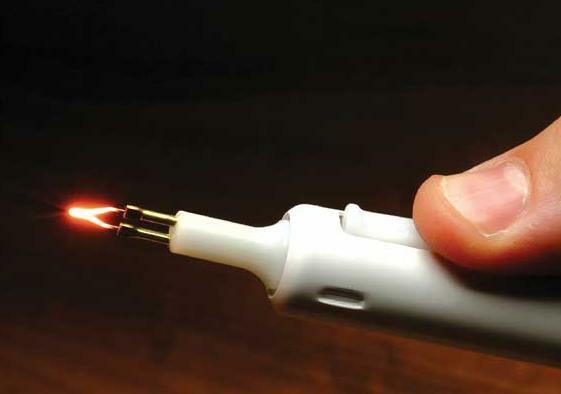 The two types of cautery used for modern surgical intervention include electrocautery which uses an electrical instrument (see photo) to generate the burns or chemical cautery which involves the application of acids, freezing chemicals, or other chemical substances that produce a chemical or frost burn. The old fashioned form of cautery was a little… less refined. A (typically iron) implement was heated to glowing red hot and pressed against or into an open wound, typically deeper wounds like arrow or bullet hole. In most cases, the person would have been better served to apply pressure to stop bleeding and then keep the wound clean with boiled water. The other historical use for cautery is to seal a field amputation. Amputation is the removal of a whole or partial limb, typically arms, legs, feet, or toes (or more rarely, castration). Prior to modern micro-surgical technique (and especially in battle-field situations where time was limited and patient numbers were overwhelming) amputations were performed by applying a tourniquet above the cut line to prevent massive bleeding, cutting through the tissue to the bone, sawing through the bone, and cutting through the remaining tissue. As you can imagine, this was a very blood procedure. The risks of infection were astronomical, but the risks of bleeding to death when the tourniquet was removed were even higher. Rather than allow their patients to die from blood loss, field surgeons performed cautery to seal the end of the amputation. Keep in mind this was also before the use of anesthesia became widespread. Ye-ouch! So when is cautery appropriate? Basically the only times when cautery is really a good idea* is when you’re in a well controlled situation (operating room, hospital ER) or when the risks of not performing cautery outweigh the huge risks of second and third degree burns. There are a few other instances when a writer might consider the benefits of cautery, though. Historically cautery has been used to brand people (as tribal markings, disfigurement, self-mutilation, or marks of ownership in cases of slavery), as a torture method, or as a means of obscuring distinguishing features (birthmark, scars). The first thing the people who aren’t the one being cauterized will probably notice is the smell. If you’ve never smelled burning human flesh (and often hair)… well, let’s just say you don’t forget it. There will be a small amount of smoke if the cautery involves heat, and possible a chemical smell if a chemical cauterization agent is used. The person getting this treatment will probably not notice much other than the burning AGONY OH MY GOD THE GOGGLES, THEY DO NOTHING! Screaming. Lots of screaming. After the fact, treatment consists of keeping it clean (preferably with water boiled for 20 minutes or so), keeping it covered with a clean dressing, and try not to use it more than necessary so the tissue can heal. Don’t poke it or pick at it. Watch for signs of infection – spreading redness, pus, blackening tissue that sloughs off, foul odors.